Last time we looked at the physical check. This is always the first test done because most faults are visible and if you don’t do it first you may have a dangerous appliance in your hand. As I said earlier, this is not meant to be a lesson in how to test appliances, that is covered in detail in my online test and tag training course. This is only an outline to show it is not a complicated process but quite simple and everyone can do it. The earth is the drain of the electrical world. It works a bit like the drain in your bathroom or laundry floor. The purpose of the drain is to safely drain any water if a pipe breaks. If the drain is blocked in the laundry, the water cannot drain through it so the laundry floods and you could drown. This could be said to have a high resistance to flow. The purpose of the earth is to drain and electricity safely away if the insulation in the appliance breaks. If the earth is blocked, the electricity cannot drain safely and you could get electrocuted. In electrical terms we call this a high resistance to earth. To find out if the earth is blocked (high resistance) we do an Earth Resistance Test. This is done using a Portable Appliance Tester, often called a PAT. The appliance is plugged into the tester and the probe is connected to the metal case of the appliance. The PAT then gives a simple PASS or FAIL result. It is dead simple to do, you just need to know how, and it is all explained in detail in my on line test and tag training course. 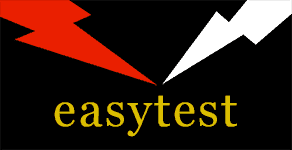 easytest designs, manufactures and markets a range of Portable Appliance Testers here in Adelaide, no mass produced imported products here that you cannot get serviced or repaired. Our on line training course is not facilitated by sales people given a few catch words and set loose. The trainer is a licensed electrician with over 10 years professionally testing, and is the co-designer of our range of appliance testers.